Please make sure to update your records with our new suite number. Please Note: Our Phone and Fax Number will remain the same. The move will provide more space for growth along with increased resources to continue to offer our agents the best customer service experience in the industry. 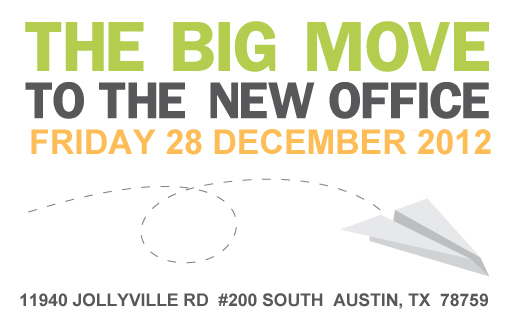 We look forward to serving all of our agents from our new location in 2013. Happy New Year! As you unwind from a hectic AEP and gear up for the holiday season, we thought we’d share something lighthearted for the blog this week. As texting becomes more and more prevalent, I'm sure you’ve noticed your children (or maybe you’ve even done so yourself) adapting acronyms for common phrases to further speed up the process. Phrases like "TTYL" (talk to you later) and even "POTUS" (President of the United States) have taken on a new understanding to those who use them often. Here is a humorous take on those acronyms for the senior crowd. WTP - Where are the Prunes? 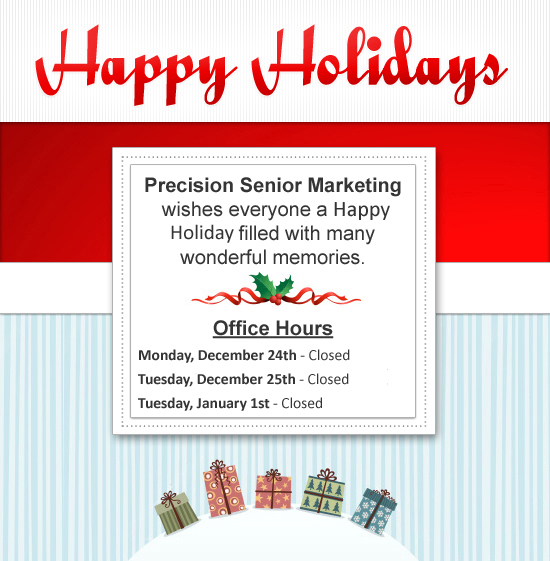 PSM wishes all of our agents a happy holiday season and New Year. If you have any questions about your current products or would like some advice for planning 2013’s business plans, give your marketer a call at 1-800-998-7715. The Center for Medicare and Medicaid Services (CMS) has announced that Medicare Parts A and B will face modest increases for 2013 deductible and premium rates. The Part A premium for those voluntarily enrolled, uninsured individuals even decreased for next year. Also, while creating a contingency margin for the 2013 Part B premium, the CMS determined that Congress would not allow the impeding physician fee schedule increase or the scheduled sequestration of benefits payment cap to take effect. This estimates that most hospitals would submit quality data and receive the full market basket payment update and the multifactor productivity adjustment. Daily coinsurance amount for beneficiaries receiving extended care services at a skilled nursing facility for days 21 through 100 will be $148. CMS announced that the standard monthly premium rate for 2013 is $104.90. However, they also noted that those who file individual tax returns with income over $85,000 and those who file joint tax returns with an income greater than $170,000 will pay 35, 50, 65, or even 80 percent more. Premium rates will increase by 5 percent. The annual Part B Deductible for 2013 is $147. Although, typically Plan F is the more popular plan in the industry, with the 2013 increases Plan G is becoming an even more attractive option. The only difference between a Plan F and a Plan G is that your client will have to pay the Part B Deductible. This means, if the premiums for a Plan F exceed $147 or more than the premiums for a Plan G, the Plan G is the more cost efficient option for your client – especially your healthy clients. Plan "G" is not exposed to Guarantee Issue. This drastically reduces the potential risk associated with Plans A, C and F.
Plan "G" is tougher to replace. Once a client has a Plan "G" and has seen the benefit of paying less over the year they are less likely to be swayed to a Plan "F". Thus, you will have an easier time retaining those clients, resulting in stronger persistency and higher renewals. Several of our agents have success selling the Forethought Life Medicare Supplement, which has the most competitive Plan G to Plan F ratio. Other products with a Plan G option include Woodmen of the World/Assured Life, Gerber Life, Heartland National, The Manhattan Life, Stonebridge Life, and the Mutual of Omaha Companies. With AEP ending today and the holidays closing in, now is a great time to take the time to look over your portfolio and decide what products and plans will best suite your clients going into the New Year. If you have any question or would like suggestions on your business plan for next year, please contact your marketer at 1-800-998-7715. How do you feel about the impending changes? Do you think you will start selling more Plan G in order to keep costs down for your senior clients?